It has tak­en more than six months, but the final judg­ment in what the Times por­trayed as the Tow­er Ham­lets ‘Mus­lim fos­ter­ing’ case has final­ly been released in sum­ma­ry form [pdf] and it is dev­as­tat­ing for the news­pa­per and its chief inves­tiga­tive reporter, Andrew Nor­folk. The Times’s pri­ma­ry source for its inflam­ma­to­ry sto­ry – the moth­er of the ‘white, Chris­t­ian child’ tak­en into care – was very far from being a reli­able wit­ness and no sto­ry should ever have been pub­lished based on her evi­dence. Far from being an ‘inap­pro­pri­ate’ plac­ing, as the Times force­ful­ly assert­ed, a Mus­lim fos­ter home was prob­a­bly the most famil­iar envi­ron­ment that could have been found for a child who had spent much of her short life with Mus­lim grand­par­ents in a Mus­lim coun­try. This state­ment is being issued on the 31st of August 2017 and super­sedes all pre­vi­ous state­ments on the sub­ject. We are appalled by the prej­u­di­cial and cal­lous report­ing in “The Times”, although not sur­prised. It is unfor­tu­nate that this appalling piece was picked by oth­er media out­lets. “The Sun” even chose to run the sto­ry even after much with­in the orig­i­nal arti­cle was fac­tu­al­ly debunked. It is heart­en­ing to see that over 4,000 peo­ple have already emailed IPSO call­ing for action to end racism in the UK press con­tribut­ing to the cli­mate of hos­til­i­ty that migrants, refugees and Mus­lims are fac­ing. Wifaqul Ula­ma urges every­one to join the call and urge IPSO to take action. Action needs to be tak­en now before our soci­ety and our coun­try is torn apart by these evil forces. We must stand togeth­er and we must stand unit­ed. We must con­demn these atro­cious­ly sala­cious head­lines, click­bait jour­nal­ism and dog whis­tle pol­i­tics. A child is to be loved, nur­tured and looked after. It is appalling to use the sto­ry around a child in order to sell news­pa­pers. There is a need to talk about vul­ner­a­ble chil­dren in the care sys­tem, and the fos­ter fam­i­lies who per­form an invalu­able duty on behalf of the state, giv­ing chil­dren the oppor­tu­ni­ty to expe­ri­ence the child­hood they deserve and which they may oth­er­wise not have had. And there are ways to do it. But dis­tor­tion and sen­sa­tion­al­ism nev­er helps. When we researched the issue from the orig­i­nal court doc­u­ment and the state­ment from Tow­er Ham­lets coun­cil, we found that there are numer­ous fac­tu­al errors in the orig­i­nal report. Doc­u­ments includ­ing the assess­ment of the mater­nal grand­par­ents state that they are of a Mus­lim back­ground but are non prac­tis­ing. The child’s moth­er says they are of Chris­t­ian her­itage. In con­fi­den­tial local author­i­ty reports… a social ser­vices super­vi­sor describes the child sob­bing and beg­ging not to be returned to the fos­ter carer’s home because ‘they don’t speak Eng­lish. While we can­not go into details of a case that would iden­ti­fy a child in fos­ter care, there are inac­cu­ra­cies in the report­ing of it. For exam­ple, the child is in fact fos­tered by an Eng­lish-speak­ing fam­i­ly of mixed race in this tem­po­rary place­ment. We would like to give more details but we are legal­ly restrict­ed to do so. The local author­i­ty shall, upon receipt there­of, trans­late the mother’s final state­ment and this order into the lan­guage spo­ken by the mater­nal grand­moth­er and shall serve these on the mater­nal grand­moth­er by no lat­er than 15.09.17. There were actu­al­ly two fos­ter fam­i­lies who cared for the child. The first place­ment start­ed in March 2017. The Tow­er Ham­lets coun­cil state­ment is about the sec­ond fos­ter fam­i­ly while the court does not men­tion the lan­guage abil­i­ties or (lack of com­mu­ni­ca­tion) of either of the fam­i­lies. 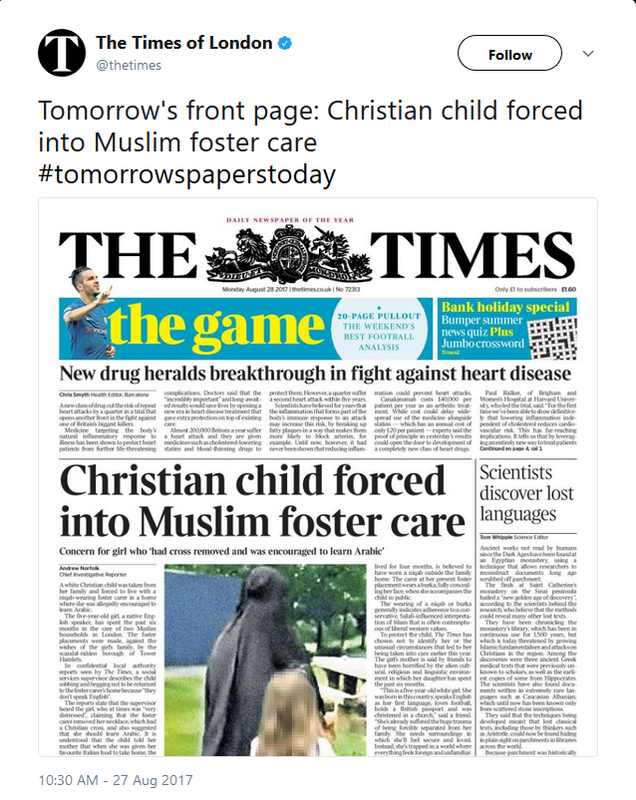 Child removed from Muslim foster family? The five-year-old was tak­en to her grandmother’s home after a court ruled that she should not remain in the place­ment organ­ised by the Lon­don bor­ough of Tow­er Ham­lets. On 27th June the court list­ed the case for fur­ther hear­ing on 29th August 2017. The cur­rent fos­ter care place­ment (which was a respite place­ment while the orig­i­nal fos­ter car­er went on hol­i­day) was due to end today. 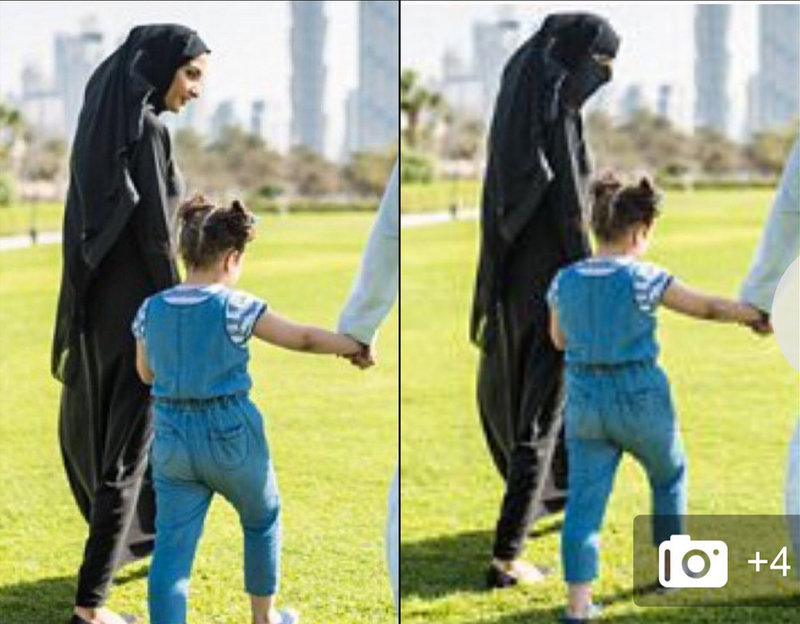 Dai­ly Mail (online) then took a stock image from Get­tys, which had no rel­e­vance to the inci­dent and sedi­tious­ly sen­sa­tion­alised it fur­ther by adding a veil to the face of the women! The orig­i­nal image is to the left while the doc­tored image is to the right. Conor James McK­in­ney has writ­ten a fan­tas­tic piece on the facts of the Tow­er Ham­lets fos­ter­ing case. We acknowl­edge his work as part of our research and appre­ci­ate his efforts.